Like many women, I am often cold. A hot shower is a special treat that I enjoy each morning. Although I'd love to remain in the warm water for hours, it's simply not pratical. 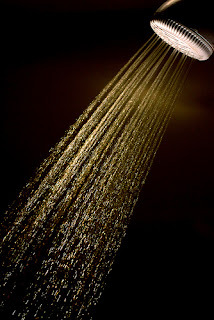 Taking a shorter shower will earn you bonus points with your family and have a significant impact on the earth. Not to mention the lower utiliy bills! Get a chic shower cap - If you have longer hair, it may be better to go a day or two between shampoos. Use a shower cap to keep your hair dry and stretch your style. When I straighten my hair, I won't wash it for two days. (Dry shampoo can buy you an extra day if you're in a hurry!) When I want to revive my curls, I'll use conditioner but not shampoo to avoid over-drying. Hit the high spots - If you work out intensively or live in a hot climate, you might need a full-body clean. Most of us, however, can get by most days by focusing on the important areas. If you work out in the morning, be sure to hit your feet, armpits, and face. Focus on any smelly areas and just let the shower quickly rinse the rest. If you choose this method, make sure to do a thorough clean at least 1-2 times per week. Switch to bar soap - I love body wash, but I find that it extends my shower by several minutes. Once the wash or shower gel is on my loofah, I want to make sure it is used up. And then I want to rinse the loofah so the water runs clean when I'm done. While a body wash or shower gel can be a great choice once or twice a week, it's often not necessary for daily shower use. Stay sharp - A dull razor is not only dangerous, but it can also slow you down. Get it right the first time by frequently changing your razor blade. If you'd like to save even more water when shaving, consider a bath. You can even add some moisturizing bubble bath! Dry Brush - Exfoliation is a fantastic way to get glowing skin. While I love a great scrub, using one on a daily basis can really draw out a shower. Consider alternating scrubs and dry brushing when you exfoliate. To dry brush, simply rub a bath brush in large, circular motions on dry skin, just before a shower. Use firm but gentle pressure to gradually loosen dry skin. Last in the series: Start out each day right with a simple morning routine.